From Ludgate Circus walk up the south side of Ludgate Hill towards St Paul's. Pageantmaster Court is about 100 yds on the right. This unassuming little court, which in reality is more likened to a narrow road, has few delights to offer the casual wanderer. Until very recently it was an excellent vantage view point of one of London's surviving World War II bomb sites, but all that is destined to disappear under developments. The Queen's Head pub, with a rough side wall where other buildings adjoined, Until the contractors moved in the Queen's Head pub stood like a protruding tooth in a wide open mouth. Until that fatal day in 1940 the Queen's Head had the company of the Blue Last tavern in Ludgate Broadway but along with the Ventura Restaurant and a philatelists shop, luck had gone out of the door and it was reduced to a heap of rubble. With the never ending scramble for City office space one wonders why this desolate plot remained for so long. This then is Pageantmaster Court; people pass along it to reach their destinations elsewhere; not many come to it, for there is not much to come to. But don't hastily turn your back on this seemingly uninspiring quarter; venture a little further towards Playhouse Yard, Ireland Yard, the intriguing Carter Lane with its numerous tributaries and the treasure will be revealed. Even so, before I leave the environs of deprived Pageantmaster Court there is one feature of history that would perhaps not immediately be associated with a court halfway up Ludgate Hill -the Roman wall. It is commonly thought that the old gateway - one of the access points to the City - stood at the Ludgate Circus junction of roads. This belief is quite wrong and in modern times is probably cultivated by the railway bridge which marred the scenery there until the early 1990's. From New-Gate (Newgate Street) the line of the wall ran along the east side of the street we know as Old Bailey (opposite, on the north side of Ludgate Hill); in fact this street took its name from a parapet erected along the outside of the wall. From this line we can ascertain that Lud-Gate would have been situated only feet from Pageantmaster Court. For nearly 1,600 years the Roman wall enclosed the City of London and was breached at six strategic points where gateways gave access to the main roads leading north, east, and west. In line from the Tower, Lud-Gate was the last and most westerly of the gates. Myth has it that the gate was built about the year 66 BC by Celtic god, King Lud, but as he only existed in the realms of fantasy we can strike that one off without further ado. We can pass through the ages a good many years before arriving at the time when Lud-Gate was actually constructed; this would probably have been during the 5th or 6th century. But who, or what was Lud? Well, if you had been around in Saxon times, you would have referred to the secondary access to a major building - the tradesmen's entrance - as the ludgeat, a word that was dropped from the English language but similar in meaning to postern, a small door or gate. Lud-Gate was far from small but compared with its counterparts was probably one of the minor ways into the City. During the Roman occupation of the City there would have been a stone bath just inside the wall where those with right of entry could clean off the grime of the dusty road from the west. On the 4th September 1666 the Great Fire swept through old St Paul's and on down the hill towards Lud-Gate. Fearing for their lives at the hands of hysterical prisoners, the warders released their captives who chased like madmen from the jail in search of another refuge. The intense heat from the Fire caused wide cracks to appear between the stones and the gate once again had to be rebuilt. Queen Elizabeth in her niche was only discoloured by the smoke and was later taken to St Dunstan in the West where she now occupies pride of place beneath the clock. King Lud and his sons, also only slightly damaged, were first removed to St Dunstan's, Regent Park and later transferred to the porch of St Dunstan in the West. London's Roman wall, along with all the gates, was demolished in 1760 and no evidence remains of either Ludgate or any of the other five gates. However, you can still see fragments of the wall which for various reasons escaped demolition. The finest example is at Cooper's Row, near to Tower Hill Station. For more on the Roman wall see Cooper's Row. Accessed from either side of St Paul's Station. It is the walkway around the rear of the station. When the Alley was first constructed prior to the 16th century (possibly 15th century) it was, of course, completely different to what we see today, surrounded by high concrete buildings. 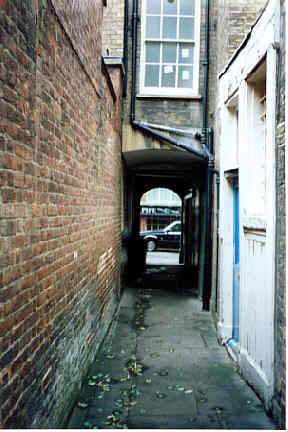 Originally it was a narrow walkway lined with houses, connecting Newgate Street and Patternoster Row. On the 29th April 1667 the Common Council of the City passed an order that several streets, alleys and passages were to be widened. It seems that Panyer Alley together with St. Paul's Alley were to be broadened to nine feet 'for the common benefit of accommodation'. The present alley is not really recognisable as an alley at all. It is merely a path around the access to St Paul's station. Its name is derived from the time when the alley was inhabited by basket makers or panyers. Set into the wall between two houses on the eastern side of the Alley there used to be a stone plaque, which was said to mark the highest point in the City. An effigy of a naked boy sitting on a panyer and holding in his hand what is thought to be a bunch of grapes; underneath, surrounded by an ornamental border, the inscription: 'When ye have sought the citty round yet still this is the highest ground. August the 27, 1688'. These two houses were demolished in November 1892. It seems that the plaque was positioned here after the Great Fire and replaced an earlier example; John Stow ambled through the Alley in 1598 and commented that it was 'so called of such a sign.' In support of his comment and the ancient existence of the Alley, the Panyer tavern, Paternoster Row, is recorded in a list of City taverns for 1430, discovered by the Brewers' Company at the end of the 19th century. From Farringdon Station walk east along Cowcross Street, cross Turnmill Street and continue for about 150 yds. Turn left into Peter's Lane and the left into St John's Lane. Passing Alley is about 100 yds on the right. Today's Alley is little changed, although there are rather less people rushing hither and thither - or perhaps I should say rushing hither and strolling thither. It is still covered at both ends with old brick houses gracefully balanced above the entrances as they always have been. There are still the sombre high walls on either side gently bowing over the narrow passage, and about half way along there used to be a solitary gas lamp, but that rusted away years ago leaving only a trace of the fragile bracket marking the spot. At the St John's Street end the access is adorned with a plain but characterful black painted stone surround, and lest you should be in doubt, the name is inscribed in bold lettering around the top curve. Passing Alley is a fine, unaltered example of a typical ancient alley in a tourist-devoid area that is truly bulging with historic interest. 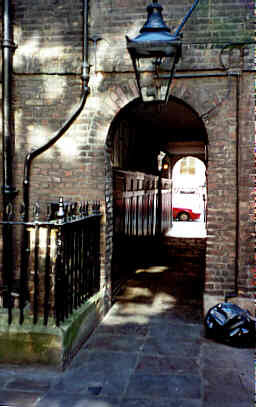 Only a stones throw away is the early 16th century St John's Gate, the only gateway spanning a public highway in London. Adjoining the gate is the Museum of the Order of St John and beyond the gate, on the east side of St John's Square, is the Grand Priory Church of the Order. All this and plenty more can be had within the space of little over � of a square mile - without the jostling crowds. Pear Tree Court first appeared on the map about the year 1683, exactly 150 years after Henry VIII had closed St Mary's Nunnery which occupied the site to the south and east of here. In those days religious communities were largely self sufficient; they owned extensive land incorporating fields for cattle and sheep, and their vegetable gardens often yielded a sufficient supply of fruit and vegetables for their own needs and to sell. It seems very likely that in this corner of their land was an orchard where, among apple and plum trees, there were also pear trees. Following its closure the nunnery buildings remained standing, but through neglect over the years they became unsafe and the domestic quarters were demolished. The land, then owned by the Crown, was sold off for housing development and various other uses. Today Pear Tree Court is more like a narrow street and along the entire length of its southern side is the grim brown and white brick building containing flats of the Peabody Trust's Clerkenwell Estate. At some stage of their perambulations, travellers about the Metropolis will inevitably come across more of these barrack like structures, all looking very similar in appearance. However sombre their appearance they stand as a memorial to a man who did more for the relief of the homeless poor than any other of his time. He was George Peabody, an American who himself was born of poor parents. With only a smattering of education there was little prospect of George succeeding in life, but after spending some years as a shop assistant he started his own wholesale business and became a very wealthy man. In the mid 18th century he moved to London, taking rooms at number 99 Eaton Place - a salubrious address if ever there was one. In gratitude for the welcome he received from the British people he donated �150,000 to provide housing for London's poor. The first block of flats were opened in 1864 in Commercial Street, Spitalfields and by the turn of the century the Trust had built dwellings in many parts of central London. From Green Park Station walk east along the south side of Piccadilly and turn right into St James's Street. Continue almost to the southern end, and Pickering Place is on the left, just before Pall Mall. Before turning into Pickering Place have a look at the two adjacent old shops - Lock and Company, hat makers, at number 6 St James's Street, and the premises of Berry Bros and Rudd, wine merchants, at number 3, owned at the beginning of the 18th century by William Pickering. He was a grocer by trade but extended his service to jobs well adrift of supplying daily provisions. To the rear of his shop he kept a generously equipped workshop and store where he could frequently be found engaged in repairing an item of furniture or tinkering with the works of a clock. In his later years, presumably as a provision for retirement, he built his house in the yard and remained here until he died in 1735. A feature of fine old oak panelling covers the entire length of the passageway where there is a single door being the side access to Berry Bros and Rudd. At the end of the passage a bracketed gas lamp hangs above the arch and surrounding the irregular shaped yard are four brick houses built by Pickering. In the centre of the yard is a piece of artwork mounted on a stone pillar. The contrasting character between grand St James's Street and the rather laid back Pickering Place is striking, but not at all out of place in this quarter of London. During the 17th century this charming little cul-de-sac was the common venue for settling differences of opinion by duelling. Turning into Pineapple Court it comes as something of a surprise to find facing us, not the Pineapple Tavern but the Colonies public house. Of course, it was at one time quite appropriately called the Pineapple but in a frenzy of unpredictable wisdom someone had to rename it. There has been a tavern standing on this site since about 1750, thought to have been built by Greene's Brewery which occupied a site in Stag Place. The brewery was purchased by James Watney in 1837 and his company continued to brew 'proper' beer there until mashing ceased in 1959. During the initial years of its business the tavern continued to function under the sign of the licensee. That was until a long missing patron returned from journeying over seas and popped his head round the door encouraging the landlord to sample a wedge of his peculiar fruit. Warily, with juice dribbling down his chops, he chomped away at the spiky exhibit and eventually, with glee in his eyes, he scoffed the lot. Eagerly enquiring of the sailor, 'what is it?' he swiftly pulled down the sign, pinned the leaves of the fruit to the door and called his house the Pineapple. See Pageantmaster Court. At Carter Lane take the right fork into Blackfriars Lane. Pass the Queen's Head public house and Playhouse Yard is about 40 yds on the left. Turning left into Playhouse Yard it is not manifestly obvious in these much changed years, that had you been trudging this way five centuries ago you would have been about to enter the kitchens of the Black Friars monastery. In 1538 the friars were sent packing while Henry VIII's henchmen, led by Thomas Cromwell, searched their monastery for anything valuable. Nothing much happened to the old buildings in the following years - they were left to decay until 1596 when the grounds were disposed of to individual buyers. At this time Richard Burbage, a famous actor of his time and pal of William Shakespeare, was on the lookout for a site on which to open London's first indoor playhouse. It was built here as a replacement for the old Shoreditch open-air theatre and with all up-to-date facilities it took off with tremendous popularity. A shared top of the bill featuring Shakespeare and Burbage was guaranteed to pull a crowd from as far a field as the town crier could broadcast. When the performances were over and the cast had taken their final bows the exuberant audiences, filled with admiration for the entertaining troop, made merry in the streets around. Naturally, this was not conducive to good relations with local residents who, wishing that Shakespeare and his buddies would be stricken hoarse, were provoked into complaining to the authorities. Despite Queen Elizabeth speaking favourably of the theatre the locals achieved their goal; the place was subsequently closed and the company of actors moved to the Globe Theatre on Bankside. In 1655 it was decided that the theatre had no further use - it was pulled down and rows of tenements were built in its place. As an additional flavouring of history it may be of interest to note that the first building of the National Penny Bank was opened around the corner in Great Eastern Street on the 1st January 1878. Over 200 people opened accounts on the first day and it was instantly popular with the less wealthy, later becoming a common depository for children's savings. The downfall of the bank came at the beginning of the 20th century as a result of unsound management policies -withdrawals were frozen and the receivers were brought in to wind up the business. Standing at the northwest corner and facing onto Shoe Lane is the City Temple, London's principal basilica to Nonconformity. It was opened in 1874 to serve the 'multitudes ever coming and going through the Metropolis'. Along its western face a two-tiered portico of four columns displays the figures of Faith holding onto a cross, Hope wrestling with an anchor, while Charity clutches a child's hand. Behind the facia all was wrecked in the Second World War and rebuilt in 1958 by Seely and Paget. Its main hall is representative of a theatre layout with a gallery and has seating to accommodate 1,400 people. A partly covered square tunnel of little character, lined with tall walls and covered in white glazed tiles. Pope's head Alley is gloomy and dull, not at all like the pre-Fire days when it was a favourite haunt of children visiting the many toy shops lining its way. The Alley was named from having been a passageway by the side of the Pope's Head tavern, which occupied the site as early as 1465 and was still going strong 300 years later. At the Reformation the owner was presumably forced to change the name; he chose the Bishop's Head but shortly after, when he assumed that the King had forgotten his fracas with Rome, changed it back. The tavern was by all accounts a massive place 'strongly built of stone', occupying the whole site between Cornhill and Lombard Street. Here, for one penny, you could indulge in a pint of wine, and while the offer lasted, a chunk of bread was given free; a sort of happy hour at the Pope's Head. Whilst the tavern flourished Pope's Head Alley was a busy place. Before the Great Fire it was a resort for fruit sellers, then came the bookseller, followed by the toy dealers parading up and down the Alley, showing off their novelties to scores of children. In the early 17th century, George Humble and John Sudbury opened the first general print shop in London at the sign of the 'White Horse' here in the Alley. Almost next door, at the sign of the 'Red M and Dagger', Mrs Milner (M) brewed and sold her potions for the cure of every ill known and unknown to man. Lloyd's Coffee House moved to premises here in 1769 after previously occupying shops in Tower Street and then Lombard Street. It was the popular meeting place for dealers and purveyors of foreign wares, where many a business transaction was settled. With most of the shop trade coming from this class of customer, Mr Lloyd hit on a brilliant idea to keep his customers interested. He started producing a weekly bulletin of ships arriving at the Thames wharfs. It was from this meagre beginning that Lloyd's of London was formed. Up on the red building by the side of the Court, in Fleet Street there used to be a clue to the origin of this curious name. It was in the form of an engraving highlighting that this was the site of the Inn of the Abbots of Cirencester. Below a perched bird, resembling a parrot, was the inscription 'The Poppinjay'. This was the sign or crest of the Abbey of Cirencester. The house was standing in the 14th century. Along the east side of the Court is the Poppins Caf� and Restaurant, Leonard and Michael, hairdressers, and Photosport film developing services, all facing a drab concrete wall on the west side. Frank Coral, bookmakers, have premises on the corner of Fleet Street and directly opposite to the Court, on the south side of Fleet Street is the quaint Old Bell Tavern. It was built in 1670 by Sir Christopher Wren as a lodging for his workmen whilst engaged in the rebuilding of St Brides church (see St Bride's Avenue). When the ash and rubble left by the Great Fire had been swept away and London was once again settling down to routine life, the Post Office moved from its location in Bishopsgate to this site in 1678. Sir Robert Vyner, the wealthiest man in England, had previously ruled the roost here; his fine mansion lay amid neatly trimmed lawns and well tended flower beds. Sir Robert wisely kept his money in securities and as the flames lapped at his door he gathered his bonds - whilst he lost his house, he retained his wealth. The Post Office maintained its position in Vyner's garden until September 1829 when it moved to larger premises in St Martin le Grande. There is a branch office on this site to this day, with its entrance in King William Street and mail boxes at the Lombard Street end of the Court. Continuing in the only theme imaginable in the vicinity of Lombard Street - money - the Bankers' Clearing House was established in this Court in 1770. It is still here today, occupying premises built in 1951 where it receives daily the statements from each of the clearing banks and settles the balance by cheques drawn on the Bank of England. Cross from St Paul's Station onto the north side of Cheapside and turn into Foster Lane. Pass the church of St Vedast and Priest's Court is on the right. Foster Lane was originally known as St Vedast Lane and although it is usually considered that 'Foster' is a corruption of 'Vedast', it is not easy to understand how such a mistranscription came about. The corruption took place very early on; by 1281 it had already changed to Fauster - it was then a matter of little time before this became Foster.